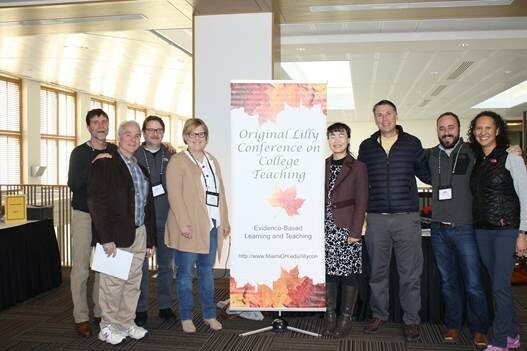 Belmont University was, again, well-represented at the 2018 Lilly Conference on College Teaching held at Miami University in Oxford, Ohio earlier this month. Eight Belmont faculty participants from religion, media studies, biology, English, psychological science, sport science and the Teaching Center attended the event. Faculty member attendees contributed four presentations for the Evidence-Based Learning and Teaching conference theme. Dr. Hyangsook Lee (media studies) provided a poster entitled “Artificial Intelligence and the Future of Higher Education: Latest Developments in AI-Based Education and Their Implications for Teaching and Learning” during the interactive poster session. Her poster considered the latest research studies regarding the impact of AI on teaching and learning and associated implications for the traditional paradigm of teaching and learning. Drs. Jason Lovvorn (English) and Sue Trout (English) proposed a connection between civility in the college classroom and the typical behaviors people bring to situations in their presentation entitled “Avoiding Genre Trouble: Best Practices to Promote Civility in College Classrooms. ” Their session offered participants novel insights for promoting civility in their own classrooms. Dr. Pete Giordano (psychological science) and Mike Pinter (The Teaching Center and mathematics) delivered an invited presentation entitled “Slow It Down: Strategies for Engaged Learning (including “winging it” once in a while)” in which they discussed activities–including mindfulness, questioning techniques, storytelling and dealing with uncertainty–based on key teaching and learning ideas from a variety of pedagogical experts, including several who have led workshops at Belmont. Dr. Marnie Vanden Noven (sport science) provided an encore presentation version of “The Elephant in the Classroom: Addressing Sensitive Topics With Skill and Courage” which she initially developed with Julie Hunt (social work) for the 2017 Lilly Conference. She explored the teacher’s role in fostering an environment where students are included and feel safe to discuss potentially taboo topics in meaningful, productive and transformative ways. Andy Watts (religion) and Matt Heard (biology; Faculty Inclusion, Diversity and Equity Committee) also participated in conference sessions and activities.